Obviously, I think that etiquette and manners today has nothing to do with wealth or social class- manners are for everyone! Historically, however, the rise of etiquette books in the Victorian period had a lot to do with the growing middle class and their desire to act like the upper classes. So someone had to teach them how to act. But then the rich caught onto this and constantly changed the rules to throw the middle classes off. Nice, huh? The moral of the story, is that there was (is?) a way to tell social class, regardless of money or education. 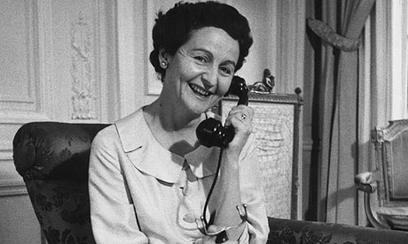 In the 1950s, Nancy Mitford (of the endlessly fascinating Mitford sisters), borrowed an idea from British linguist Alan S. C. Ross about U vs non-U vocabulary and wrote a very popular essay about it, “The English Aristocracy,” in which she gave a list of words that were Upper Class (U) and their non-U (not Upper Class) counterparts. She argues that with the Upper Classes in Britain no longer being necessarily richer or better educated than anyone else, their language was the only thing left to distinguish them as Upper Class/aristocratic. Perhaps you will notice a pattern in both the Mitford and Post lists- a large portion of the “non-U” word choices are pretentious and overly wordy. Mitford actually says that the “non-U” speakers are mostly among the middle class- the lower classes tend to use the same words as the U speakers. The reason for this is that the lower and upper classes were pretty comfortable with their station and it was only the middle classes that were striving to “better themselves” by using fancy words that they thought sounded upper class. Now, Mitford’s essay wasn’t completely accepted as truth, even at the time. Evelyn Waugh wrote a rebuttal essay that was published in Noblesse Oblige: a book containing Mitford’s essay, the original article by Ross, Waugh’s rebuttal, and other related essays. Waugh argues that these “U” and “Non-U” differences don’t actually exist as language is constantly in a state of flux and is also regional and family specific. However, I think the point about pretension vs being comfortable with yourself absolutely does exist, and for that reason, Emily Post’s list seems to hold up pretty well. Pretension is sort of rude because it is extreeeemely annoying- we all know someone who uses “myself” instead of “me” (incorrectly) and other big words that they don’t seem to know the meaning of, or they just talk in a roundabout manner of “needing to equip themselves with the necessary instruments of learning” instead of “buying school supplies.” This kind of thing makes everyone uncomfortable, and as we all know, causing discomfort in others is one of the hallmarks of rudeness. What say you? Is pretension rude? Are there any words or phrases that you would argue are definitively class-based? Are middle class people in Britain really trying to act working class? Tell me in the comments!! their lords and masters, trying to impress none, called a spade a spade. Another example: my pretentious Mother-in-law (who uses all the non-u examples given here and puts milk in first) insists on calling a glass a “goblet”. She also call chocolate bars “treats”, says “basin” instead of sink, and (in a complete coincidence in no way related to her lower class roots) is obnoxious, overbearing and smug beyond tolerance. She also insists that the gardener come to the back door to be paid when he’s finished (in a three bed bungalow!) and uses paper napkins instead of linen (which she calls serviettes).